1. Click on a graphic to reveal its written description. Click Zoom to view the graphic in detail. Click Explore & Comment to view specific features and share your thoughts. Alternatives you have already viewed will remain highlighted. 2. Use the Flip All button to compare all written descriptions. 3. Prefer to review a select few? Filter alternatives using the radio buttons. This page is a tool for your exploration. 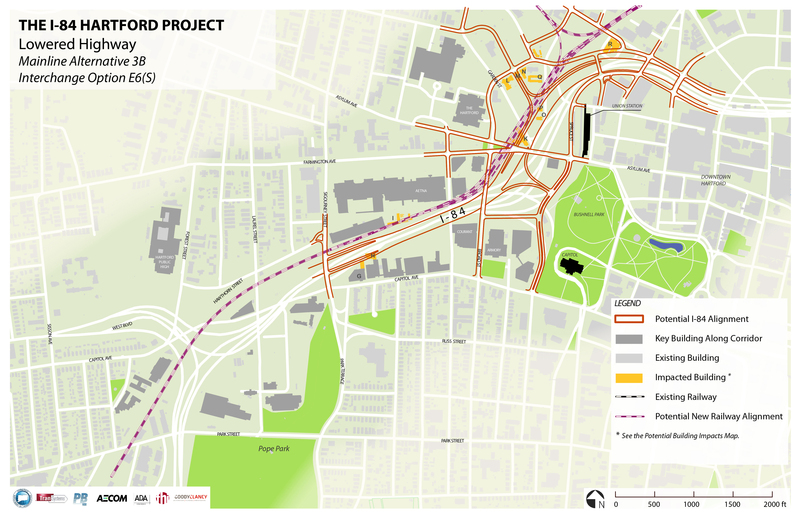 Take a look at the mainline alternatives, or the path that I-84 takes through Hartford. Review the interchange options, or ramps. The ramp design alters the local roadways. How might the different options impact you, your neighborhood, or your commute? Your opinion helps us understand potential benefits and impacts. Each alternative and option affects traffic, business, communities, and the environment differently. The more feedback we receive, the better we can design a corridor that works for all! What do you like? What don’t you like? Explore the graphics below by clicking on them, share your thoughts, and ask plenty of questions! As the project evolves, this page will highlight our latest work. This interchange concept consists of a full diamond interchange located at a new road connecting West Boulevard to Laurel Street. This interchange option routes westbound on- and off-ramps to a realigned Capitol Avenue and eastbound on- and off-ramps to Laurel Street. This interchange option routes eastbound on- and off-ramps to a new road connecting Asylum Street and Capitol Avenue, and westbound on- and off-ramps to Edwards Street. The Sigourney Street eastbound on-ramp and westbound off-ramp are rebuilt. This interchange option routes eastbound on- and off-ramps to a new road connecting Asylum Street and Capitol Avenue, and westbound on- and off-ramps to a realigned Cogswell Street. The Sigourney Street eastbound on-ramp and westbound off-ramp are rebuilt. This interchange option routes eastbound on- and off-ramps to a new road connecting Asylum Street and Capitol Avenue, and westbound on- and off-ramps to Myrtle Street. The Sigourney Street eastbound on-ramp and westbound off-ramp are rebuilt. This interchange option routes east and westbound on- and off-ramps to a new road connecting West Boulevard to Laurel Street. This interchange option routes east and westbound on- and off-ramps to a new road connecting West Boulevard to Capitol Avenue. This interchange option routes westbound on- and off-ramps to Capitol Avenue and an eastbound off-ramp to Laurel Street. The on- and off-ramp configuration for this option is identical to West Option 3 W3-1. A new road connects West Boulevard to Hawthorn Street. This interchange option routes westbound on- and off-ramps to a new road connecting West Boulevard to Capitol Avenue. An eastbound off-ramp would touch down on Laurel Street. The on- and off-ramp configuration for this option is identical to West Option 3 W6-1. However, intersections with the new road at Forest Street and Laurel Street are at-grade. This interchange option routes east and westbound on- and off-ramps to Sisson Avenue. This interchange option routes east and westbound on- and off-ramps to Broad Street. This interchange option consists of a full diamond interchange at Asylum Street and a half diamond interchange at Sigourney Street. This interchange option routes east and westbound on- and off-ramps to Asylum Street. The Sigourney Street eastbound on-ramp and westbound off-ramp are rebuilt. This interchange option routes an eastbound off-ramp and westbound on-ramp to Broad Street, and eastbound on- and westbound-off ramps to Asylum Street. This interchange option distributes the ramp system throughout the local roadway network. This interchange option routes east and westbound on- and off-ramps to a realigned Myrtle Street-to-Church Street connector road. The Sigourney Street eastbound on-ramp and westbound off-ramp are rebuilt. This interchange option routes eastbound on- and off-ramps to a new road connecting Asylum Street and Capitol Avenue, and westbound on- and off-ramps to Cogswell Street. The Sigourney Street eastbound on-ramp and westbound off-ramp are rebuilt. This interchange option routes eastbound on- and off-ramps to Spruce Street, and westbound on- and off-ramps to Cogswell Street. The Sigourney Street eastbound on-ramp and westbound off-ramp are rebuilt. This interchange option routes eastbound on- and off-ramps to a new road connecting Asylum Street and Capitol Avenue, and westbound on- and off-ramps to Asylum Street. The Sigourney Street eastbound on-ramp and westbound off-ramp are rebuilt. This interchange option routes eastbound on- and off-ramps to a new road connecting Asylum Street and Capitol Avenue, and westbound on- and off-ramps to Cogswell Street. We admit, the naming can get a bit tricky! This guide explains the naming convention for the alternatives. 1. Alternative 3 is the number for the Lowered Highway Alternative. • Alignment 3A: This alignment partially addresses the existing undesirable horizontal geometry by removing the closely spaced reverse curves between Broad and High Streets. It also allows a significant portion of the proposed highway to be constructed while maintaining traffic on the existing highway. • Alignment 3B: This alignment further shifts the highway between Broad and High Streets to the west to meet today’s design standard and fully eliminate the deficient horizontal curves. • Alignment 3C: This alignment is similar to the existing highway alignment in an attempt to minimize property impacts. 3. Alternatives next refer to either the the western half (W) or the eastern half (E) of the corridor. Think of Sigourney Street as dividing west from east. An western option will be matched with a eastern option. 4. An alternative with (S) indicates an interchange at Sigourney Street. 5. For example, Alternative 3C E1(S) is the alternative one for the eastern half of the Lowered Highway Alternative alignment 3C, with ramps at Sigourney Street.